X-Wings, fall in formation and swoop down to THE COMIC BUG (either location) to celebrate STAR WARS triumphant return to MARVEL COMICS! 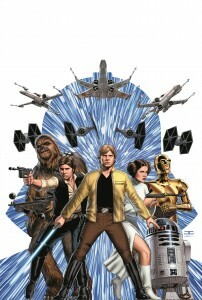 STAR WARS #1 by Jason Aaron and John Cassaday launches January 14th and captures the spirit and fun of the original Star Wars trilogy like no comic before! Show your STAR WARS spirit between the hours of 5:00 p.m. and 8:00 p.m. by dressing up as your favorite STAR WARS character and receive a FREE copy of the first issue! We'll have a slew of variants available too and special STAR WARS treats by our friend justJENN designs while supplies last! The force is strong with this one, boys and girls! It's our first event of 2015 so let's blow it up like a DEATH STAR!